Thick, fudgy Mint Chocolate Chip Brownies are loaded with tons of mint chocolate chips, they make the perfect dessert to satisfy your chocolate cravings! Can you believe St. Patrick’s Day is coming in a couple of weeks!? I’ve never really been a big fan of wearing green to avoid getting pinched, I’ve always found it really annoying. But holiday food is one tradition I can get behind! Move over lucky charm style rice crispy treats, I just want all the brownies. 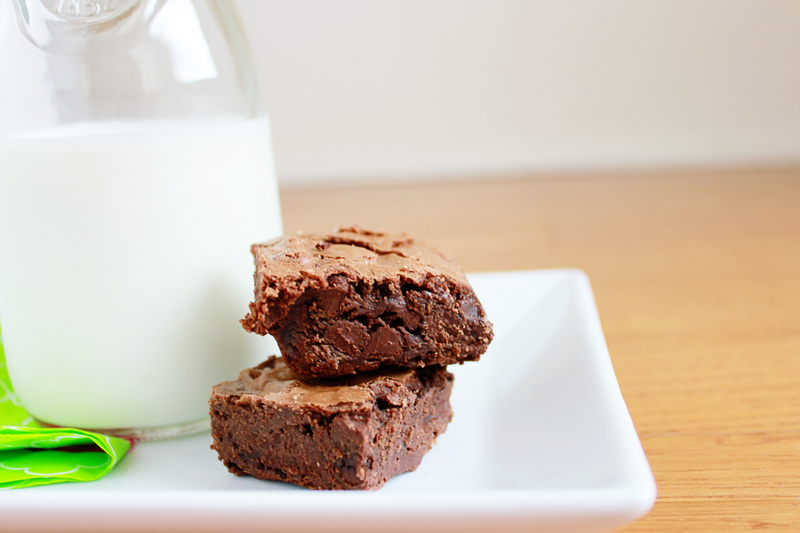 I know what you’re thinking – brownies again!?! I know, I know… well my mom came to visit Monday and she requested brownies; since I aim to please, I decided we had to make some. My mom loves anything with mint and chocolate and just happened to have brought some mint chocolate chips along with her – hint, hint huh? I went with my go to brownie recipe and added in the chips, it was only a small tweak, but a noticeable difference. Mom got a little chip happy and dumped in 3/4 of the bag, so these brownies turned out extra fudgy, which in my opinion is always a good thing. So grab a glass of milk and snuggle up with one (or two) of these delicious, chocolatey squares; enjoy and happy baking! Preheat your oven to 350º and prepare an 8"x8" baking pan with spray. In a large bowl combine the sugar, butter, vanilla, egg and water, stir to combine. In a separate bowl whisk together the cocoa, flour, baking powder and salt. Add the dry ingredients to the wet until just combined, fold in the chocolate chips and transfer the batter to the pan. Bake for 18-20 minutes, remove from the oven and cool completely, slice and serve. I’m not a huge mint chocolate fan usually, but these were so good! i haven’t seen enough chocolate + mint recipes lately… thanks for bringing the perfect combination back!! Thanks Ally, I hope you’ll try them! These look great, Emily! Definitely trying them! These look so good! I enjoy mint flavored desserts. Featuring this on Thursday’s Things to Make This Weekend segment. Thanks for linking! Mint and chocolate chip… YUM!!!!! I love making myself hot chocolate with mint chocolates!! I bet these brownies would taste WONDERFUL with it! Yum, these can be breakfast, right?